Original plan was to write on Bitcoins. But for Bitcoin related MCQs, group discussion (GD) and interview questions, one must know the basics of money itself. Only then you can see how Bitcoin is better or worse than the money we use today- rupees, dollars or Euros. Hence a long series of articles. In the first few of articles (total 3), we’ll see why did people start using traditional money (Rupee, dollar), how is it better than bartering system. And how is bitcoin better or worse, on those parameters? In the second batch of articles, we’ll see evolution of money system: from commodity money, metallic coins, fiduciary money, gold backed paper currency, fiat money, bank money etc.-what were their advantages and limitations. And how is bitcoin better or worse on those parameters. And in the final articles, we’ll see what is bitcoin exactly? from where does it come? How does it operate? Advantages, limitations, future applications and regulatory issues etc. Bitcoin is a digital code. (Some) people use it as currency. Started in 2009 by Satoshi Nakomoto. He could be a man or a woman or a group of people- real identity unknown. Aluminum is hidden inside bauxite ore in earth. Similarly, Bitcoins are hidden in data “blocks” designed by Satoshi and spread across the internet. You can mine Bitcoins by solving those datablocks using special computer softwares. Reward for solving one data block=25 bitcoins at the moment. Total number of Bitcoins in the system =~21 million. Additional bitcoins cannot be created beyond that. Sell him some goods/services, and earn Bitcoins in return. OR you can just wait for the BTC vs.$ exchange rate to rise then sell your bitcoins to a third party. But what about anonymity and terrorist angle? what about money laundering? what about inflation? isn’t this a ponzi/MLM scheme? We’ll all those things in detail later on. I gave the overview right now, because for next 5-6 articles, atleast ^this much knowledge of bitcoin topic is required before we start comparing Bitcoin system with barter system and money system. Now let’s start first article. People have been trading with each other even before the advent of money, coin, cash, currency, rupee, dollar, euro or Yuan. Simplest form of exchange. Had all nations did foreign trade on barter system, there will be no headache of foreign exchange rates and associated problems. Today if Dollar strengthens by some action of US federal reserves (=American RBI), then it automatically becomes expensive for India to import oil from Saudi=>everything else transported through petrol/diesel becomes expensive= inflation. Less chances of overproduction, hoarding, profiteering etc. =less chances of inflation. Although it’ll be wrong to say there will be no inflation in barter system- because war, famine and natural disasters can create mismatch in supply and demand even in a barter system => lead to inflation. Difficult to concentrate wealth= Less inequality of income, and all the social problems associated with it. Barter system ensures “need” based production. In money system, firms create products to create demand e.g. so many softdrinks and plastic bottles+ the subsequent harm to health and environment. Barter system promotes personal contact among individuals, social harmony, and healthy community life, joint families etc. What are the limitations of Barter System? barber But I already have 200 kilos of rice from previous customers. I don’t want rice anymore! I’ll cut hairs only if you bring 1 kilo tomatoes as payment. Mallya My son wants to get admission in your coaching class. I can give you 500 beer bottles as fees. Sir I don’t drink at all! Although I do want new table and benches for my classroom. Mallya But I don’t know any carpenter in this area, and even if I find one, there is no guarantee he’ll accept beer bottles as payment for making furniture! Thus, under barter system, the “wants” of two parties must coincide with each other, otherwise they cannot trade with each other. This increases the transaction cost as everyone will have to waste time and energy to find another party with double coincidence of wants. Money system solves this problem. Farmer can sell his rice for money, use that money to get a haircut, and barber can use the same payment to buy tomatoes from another farmer. Money thus facilitates the exchange of goods and services, lessens the time and effort required to carry on trade. Fiat money= money issued by the government (or its central bank) example Rupee, dollar, Yen, Yuan. Bitcoins are not issued by any government. Bitcoins are unique pieces of digital codes that (some) people accept as ‘digital currency’. It is legally recognized money for settling all payments and debts within the territory. If you walk with a 5 rupee coin to a tea-vendor, he must serve tea, irrespective of your race, religion, color, caste, age or gender. If he refuses to serve tea, he’ll be in legal trouble. An IT professional in Banglore may accept bitcoin payment for creating software for some American businessman. But if the same techie offers to pay house rent in bitcoins, the landlord is legally free to refuse this payment and can even order him to vacate the property. Even better, you can get your rupees exchanged in a foreign currency and import any commodity from any part of the world to India. So a fiat money (rupee) removes the “double coincidence of wants” for the trade within country and abroad. Bitcoin removes the ‘double coincidence of wants’ ONLY for the people who believe in bitcoin system, and not for everybody everywhere. trade can happen without double coincidence of wants? No Yes Yes, if two parties agree. In the barter system, buying/selling/trade can only happen, when two parties want each other’s stuff- the double coincidence of wants e.g. farmer wants haircut and barber wants rice from that farmer. But that doesn’t always happen, so each household tries to produce all of its daily requirements- from growing green tea, tomatoes, chilies in their backyard; raising cows and poultry for milk and eggs; even making pickles, paper and papad for entire year. Good from Gandhian principle of “self-reliance”. Food inflation is kept in check- because everyone is growing vegetables in their backyard. Everyone is wasting their time and energy to become jack of all trades, instead of becoming master of a single trade -medicine, engineering, construction, accounting, teaching, singing, painting etc. Thus, a bartering economy is less likely to produce specialists like Alexander Graham Bell (telephone)=> Vin Serf (Internet)=> Sergey Brin (Google) because everybody busy growing vegetables in their backyard and trying to become self-reliant-jack-of-all-trades. And even if there are talented specialists, they won’t have the necessary capital or resources to continue their research. Imagine how many parties with “Double coincidence of wants” you’ll need, for assembling the parts of a Large Hadron Collider or a Param Supercomputer. Money system also facilitates savings to become ‘investment’ for the entrepreneurs => more companies, more job, division of labor, optimal usage of manpower, good for economic growth, R&D and international trade. And with the money thus earned, anyone can buy his daily necessities, doesn’t need to grow vegetables or rear cows in the backyard. Just like traditional money, Bitcoin also promotes division of labour, but it is limited by the factor that not everyone accepts Bitcoins- especially the local milk-veggie sellers. So if a software professional decides to live only on ‘bitcoin’, he’ll have to start growing vegetables and wheat in the backyard of his house, arrange a goat/cow for milk, and so on, we are back to square one- everyone trying to become jack of all trades like in Barter system. Imagine a laptop manufacturing company- owned and operated by an AI (or robot) that accepts bitcoin payment, robots make and pack the laptops into parcel, and drones deliver them at your door step. AI uses these bitcoins for paying the cost of raw material, warehouse rent, electricity bill etc. to humans (or other AIs). And whatever bitcoins ‘left’ (=profit), are reinvested in buying more drones, bigger servers and so on. This is not possible in the present money system because legally- an AI or Robot doesn’t meet the “KYC norms” for opening a bank account = impossible for them to pay electricity bills through netbanking or creditcard! trade can happen without double coincidence of wants No yes Only if both parties agree. Promotes division of Labour? No Yes Yes, lot possibilities in future. JK Rowling Give me a cup of tea, I’ll give you two pages from the latest Harry Potter book. chai-walla I don’t want just two pages, I want the whole book for my son! Even if chai-walla continues serving tea to Ms. Rowling for 300-400 days, gets all the pages of Harry Potter book and staples them together => still that stapled book will not sell at the original value of a brand new Harry potter book (which is say worth 30 kilos of rice). You cannot always re-unite the divided values. Jeweler wants a matchstick box. But it’s not possible to divide gold to such a micro-micro-micro quantity where gold becomes proportional to the value of a matchbox. Mallya wants to buy a pencil box for his son, offers 1 table-spoon of liquor for 1 pencil box but stationary-walla will not accept because such low quantity of alcohol cannot give the kick. To pay for a cup of tea, Picasso cannot cutout 1 mm2 of canvass from his original painting. Fiat Money system (and Bitcoins) don’t suffer from this problem of ‘divisibility’, and hence facilitate the trade. You can see it is possible to divide 1 BTC into so many small parts, so even if new bitcoins are not created, it can continue as mode of payment by lowering the corresponding values of commodities. e.g. if today MRP of 1 laptop =1 bitcoin then in 2050, MRP of 1 laptop may adjust itself to 0.00165 Bitcoins, if there is shortage of bitcoins. And still you can pay 0.00165 BTC to someone by simply typing that specific amount in your keyboard. Same thing is not possible with rupee or dollars because of the chillar shortage in real life. Even if items are divisible, their fungibility is a problem under barter system. The ‘value’ of first five pages of harry potter book= Not same as the value of last five pages of the same book. Because in the last pages you get the climax so they’re more precious= not fungible. Value of one diamond of 100 carat = not equal to ten smaller diamonds of 10 carat each. In this case, bigger the size, more precious. Even those 10 carat diamonds are not mutually interchangeable because their individual value may vary depending on cut,color and clarity.= not fungible. If Picasso’s painting was cut into nine equal square parts, then Central Square will be more precious than others. So you cannot interchange them. And if you glue these torn parts together= its total value will be far less than the original painting=not fungible. Exception: Precious metal. Value of 1 kilo gold bar= Value of 100 gold coins of 10 grams each. You can melt to reunite them, you can melt again to divide them. And those 100 gold coins will be interchangeable because their individual value will be same.= fungible. But by and large, goods are not fungible and this creates obstacle in barter trade, when two commodities are not available in their standard weight/size. For example, Suppose the ongoing barter rate is 5 kilo salt = one live hen weighing 500gms. A poultry farm owner wants to buy 2.5 kilo salt. He gives the whole live hen to shopkeeper. Common sense suggest that shopkeeper should give 2.5 kilo salt and cut half of the hen and return it. But which ‘half’? In non-veg cooking, the legs of chicken are considered more valuable than its head and neck upper part. = dispute between customer and shopkeeper. Overall, the customers in a barter-trade will end up buying more than what they really need. (e.g. 5 kilo salt even if he needs only 2.5 kilo. )= considerable wastage and sub-optimal use of resources. 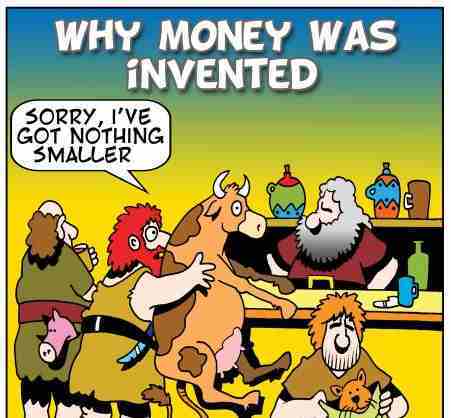 Money system solves this via “fungibility”. Similarly ten notes of Rs.100 can be exchange for a single note of Rs.1000 and so on. But there is an exception: Someone might offer 1000 rupees for a single 10 rupee note that has unique serial number like “ABCD-123456789”. but ignoring such exception, currency notes are fungible. So, if you give Rs.100 note to shopkeeper to purchase a ten rupee worth ballpen=> he’ll give you 10 rupee pen + one note of 50 Rs. + four notes of 10Rs. Persistent shortage of chillar coins. And if you cut a ten rupee note into ten parts using a scissors, it’ll not become ten 1Rs. notes. Mutual substitution possible. it doesn’t increase or decrease the value. e.g. 100 centibitcoins (cBTC)= 1 bitcoin (BTC). As such chillar/change problem doesn’t arise in Bitcoin because you can pay exact amount to the seller. E.g. if a pen valued at 0.4 BTC. you can type 0.4 in keyboard and eletronically transfer that amount to seller. It’s not like you have to give him 1 Bitcoin(BTC) and he gives 1 pen + 0.6 BTC in return. This is a digital transaction after all. You may have read in newspapers that Bitcoin transactions are anonymous and hence can be used by terrorists, druglords and tax evaders. Therefore, some experts have came up with the idea of coin validation. We’ll see about that in a separate article later, but for the moment the gist is:- Through coin validation software, you can separate GOOD BITCOINS (those earned through honest work) vs BAD BITCOINS (those earned through hacking & other illegal activities) via analyzing their transaction history and origin. This “coin validation” will destroy the fungibility of bitcoins. How? Because then most users will refuse to accept ‘bad bitcoins’. Some American users might even refuse to accept bitcoins originating from people of Cuba, Pakistan, Afghanistan, North Korea or Iran-for the fear that later US authorities may persecute/harass them while hunting for Bad Bitcoins/Al-Qaeda/Terrorists. trade can happen without double coincidence of wants No Yes Yes, if both parties agree. Promotes division of Labour Hardly yes Yes, but limited @the moment. Fungible? Not always Yes Yes, for now. (A) Money brings down the cost of transaction in trade, compared to barter system. (R) Money promotes division of labour. (A) A trader is free to refuse payment in Bitcoins. (R) Bitcoin is not a fiat currency. (A) A Barter economy is less likely to have to food inflation. (R) In Barter system, trade can happen without double coincidence of wants. It is a digital fiat currency without fungibility. It is not a fiat currency but has all the properties of a fiat currency. One fiat currency can be exchanged with other fiat currency. Bitcoin cannot exchanged with fiat currency. Correct set of fungible pairs? Q7. Which of the following statement(s) is/are incorrect? Bitcoin algorithm is designed to generate 21 million coins every year. There are two types of Bitcoins: mined bitcoins and exchanged bitcoins, they’re not fungible among themselves. Smallest unit of Bitcoin is called Satoshi. Q8. Which of the following is/are the benefit(s) of barter system over money system? Trade is possible without double coincidence of wants. Bartered commodities are always fungible. Q9. If a Barter economy is transformed into Money economy, what will be the consequences? yes,it is possible to use it as black money and it was virtually untraceable,read about silk road.they used bitcoins to sell drugs like flipkart in usa,its shutdown now and all people involved are caught. Sir u said that u will write a detailed article on Analysis & Strategy of Mains after the bigger picture emerges out of Mains 2013. We all would be very thankful for ur help. Awesome article…I wonder how you manage to collect so much info sir…it would be a lot of time consuming for an aspirant to know the issues from the base level….thanks! Hey guys, am self-studying (no coaching) from delhi(south). Thinking of making a study group of 4-5 serious aspirants (delhi based ofcourse!!) for ’14 attempt. Something like meeting on weekends and dividing the load and stuff..
Iam from vijayawada.My optional is philosophy.Are you taking any coaching?Iam preparing self at home. hi pavan. im also frm hyderabad. my optional is also anthro. where do u live? If meeting is not possible,sharing of important articles through mails is also a great idea. By the way, so happy to revisit the old days.Mrunal sir thanks again. I am from amritsar my optional is sociology and i’m in rajendra nagar haing coaching but no group as such to study so i’ll be happy to be a part and prepare. hey… evn m also prepng wdout prior coachng.. I hav took geo as my optional nd m findng it too vast.. Oh God.. dunno how to prepare… last tym lost d battle by some 20 or 25 marks.. hope I cn make it ds tym..
Was expecting an aricle on this topic. Thnx mrunal!! Q7. Not 21 million bitcoin ‘every year’. Q6. Bitcoin is perfectly fungible with Satoshi. Q2. Fiat currency are like bonds. Bitcoins lack that binding authority (at the present). i think for 7 the answer must be d only…. bitcoin itself is the smallest unit + nt 21million evry year nd there is no type bt ways of getting bitcoins so all statment are wrong. corresponding option is D.
nd thanks for the expalnation of 2nd question. in 7th question we have to give incorrect statement/s. Satoshi is the smallest unit of bitcoin. This statement is correct, other two are incorrect. So ans will be A.
yep 7th ans should be A. Well it is unregulated and the people behind the project want it to remain so,as far as i know. Mrunal has as usual given a beautiful and concise summation about this and yes there are concerns about it but bitcoin is relatively new and has potential.The concern of criminalized transaction is true esp. with the silk road but yes you can try to launder using Bitcoins but good luck with that cause its very easy to track the currency. I have been keeping track of this a long time,my brother even owned some bitcoins in 2010 and this coin was made by the libertarian philosophy of keeping governments out of it and i hence believe minimal regulation only would be possible.Chinese sure banned it and hence send the value down,but EU is seriously considering it.Germans even allow it in Stocks i think.The current concern is chiefly due to the silk road and deep internet crackdown on it and also its volatility due to its new found popularity. What is silk road here? Here is fellow medico, want to prepare in a group with Medical Science optional. •Started in 2009 by Satoshi(not by Santoshi mata) Nakomoto(its not Nako-moto). I think Ans for Q7 is A . please clarify. Yeh! yeh! yeh! mrunal bhai you are back again….reading your article is more fun than watching dhoom 3.. Thank u Mrunalji for the article… expecting more…. Mrunal JI is bAAck with a Baang !!! Dhooom 4 !! in question 5 , Option 2 :- bitcoins can be exchanged with fiat currency is TRUE. Because bitcoins can be traded xchanged in stock exchanges & or even be sold. so answer for question 5 should B. Also mrunal. whenever you are publishing MCQ’s , please also request you to publish the answers for the same. for q 7 answer should be A. The battle for the next year begins.